Its craggy architecture looks straight out of Harry Potter. The Barrington Town Hall. Photography by Chris Vaccaro. It is a chilly, crisp Thursday afternoon. I am bundled up; a marshmallow-like jacket zippered to my chin, a wool scarf wrapped around my neck and shoulders and mittens — one with a gaping hole exposing my right thumb — keep the cold New England chill from my bones. I fumble up the steps of the Barrington Public (Peck) Library and, once inside, make my way downstairs to the Barrington Preservation Society Museum. It’s a one-room space filled with exhibits of the town’s history, where I meet Julia Califano, previous president of the society. The members of the Barrington Preservation Society (BPS) trace the history of this once agricultural town, from its earliest Pokanoket Native American settlers to its European settlement of Nockum Hill in the mid-1600s to the shift in the town’s agricultural heritage and brick-making movement. 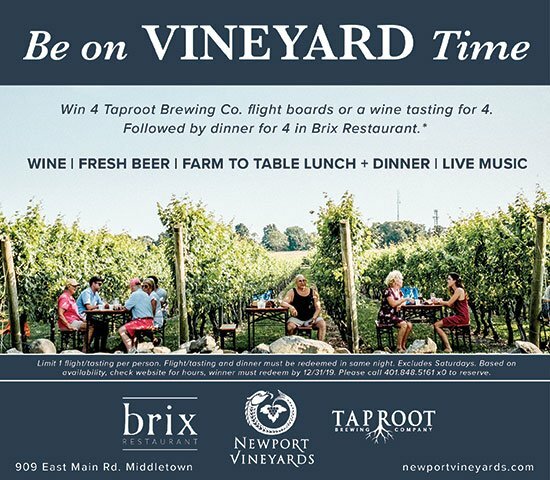 With a development as a welcoming summer community that both tourists and locals flocked to in the late 1800s to its evolution into a suburban commuter town after World War II, Barrington has quite the history with many transformations to prove it. But it’s not just the Italian immigrants, the widening of streets or the tourism that brought change to Barrington. Califano gives me a quick tour of the museum, where I learn a little bit about the town that 16,000 people call home. My personal favorite artifact? The original architectural plans of the Town Hall located just next door. We make our way back upstairs and out the front of the library, where Califano offers to give me a tour of the town’s most iconic building. I look up in awe, feeling as if I just came across a real-life scene out of Harry Potter. 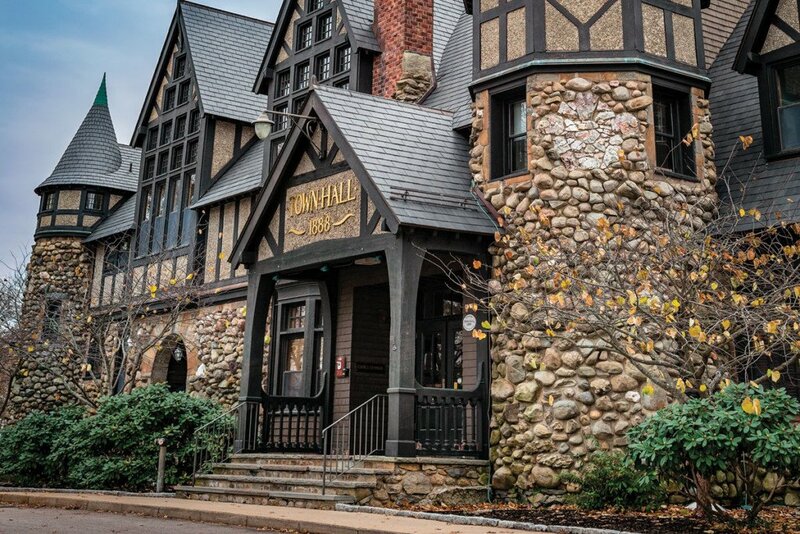 Perched high atop a hill overlooking the center of town, Barrington’s Town Hall is a sight and treasure all on its own. The Tudor revival-style building (really, it looks like Hogwarts) is faced with stones, has a tall steeple and is finished off with dark trim accents. Gold lettering above the entrance reads: “Town Hall” with “1888” written underneath. But this magnificent building reigning over the town hasn’t always been there. In fact, at one point, there was no Town Hall at all. After multiple failed attempts, town residents officially voted ninety-four to thirty-six in April of 1887 to appropriate $15,000 for a town hall to house the town clerk, tax collector, town treasurer and town council meeting rooms, a high school classroom, a lab and recitation room and a public library, too. Although there have been many changes to the building including its use, one thing has stood the test of time: its stately stone-ender façade. It’s said that some fragmented rocks on the front of the steeple are chips from Plymouth Rock, too. They were placed in the space where a clock was meant to be installed and have been set in stone ever since. 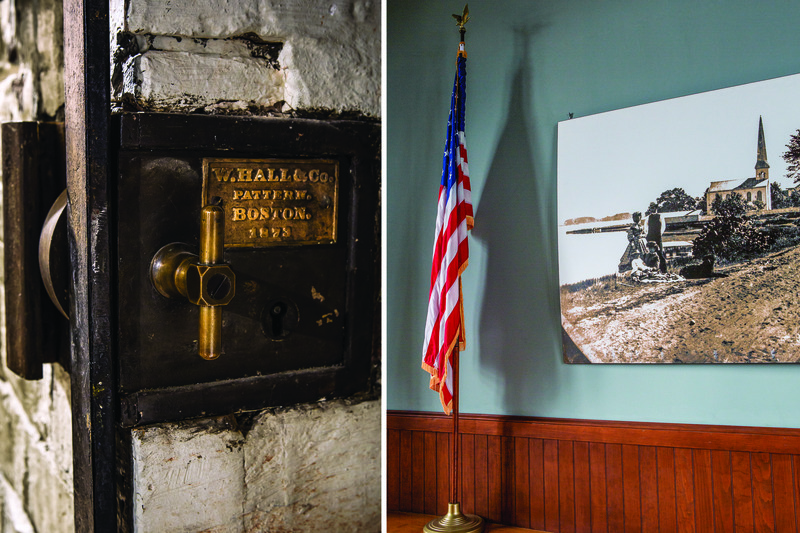 Top, left to right: Barrington has a rich history of brick making, many of which were used for buildings in Providence; the 1930s jail cell in the Town Hall is located on the lower level; old maps and records can be found in the town vault. Bottom, left to right: Stones are configured on the side of the building in the shape of a person; the council chambers feature the original vaulted ceilings; Barrington Preservation Society holds the original architectural plans for the Town Hall. Photography by Chris Vaccaro. And so, with the go-ahead from the town’s folk, the construction of Barrington Town Hall was fully underway. With the allocation they were given, $14,997.05 was spent on the construction and $2.95 was spared and given back to the town. In less than a year, at the tail-end of 1888, the building was ready for occupancy. It was truly the center for it all: Besides offices, a school and a library, the Town Hall housed a police department on the lower level; its jail cell is still intact today. It was also home to a small theater/auditorium that was rented out for productions and social occasions. Eventually, due to acoustic issues, dropped ceilings were added to the original vaulted ceilings. However, in the late 1990s, the room was restored to its original full height, no longer a stage but now the town council chambers. But let’s back up a bit. Around 1917, the high school moved next door into the Peck Memorial School building and the library was moved into the south end of the Town Hall. As years passed, the Town Hall underwent additional remodeling and maintenance. The library was expanded several times (people sure do love to read!) until it outgrew the space around 1984. Donald J. Prout Associates Architects were hired to design renovations to the town and school offices and redesign Peck School to house the library, a few additional meeting rooms, the BPS Museum and senior center, too. Overall, $2.3 million was spent on the updates. But how did they move hundreds of thousands of books to their new shelves? Citizens of Barrington showed their community spirit by participating in the book brigade, a human chain in which they lined up between the two buildings and passed the books from one person to the next. Left: The gate from the old jail cell. Right: Old photographs of the town can be found in the council chambers. Photography by Chris Vaccaro. As Califano shows me the rest of the Town Hall, I visualize the building in its original glory — the clamoring and helpful support of the excited townspeople during the book brigade and how, over 130 years, this building has truly been the heart of the town in one way or another. Although the building now houses offices including the town clerk, tax assessor and the school administration offices, I find that the Town Hall still showcases its rich history. 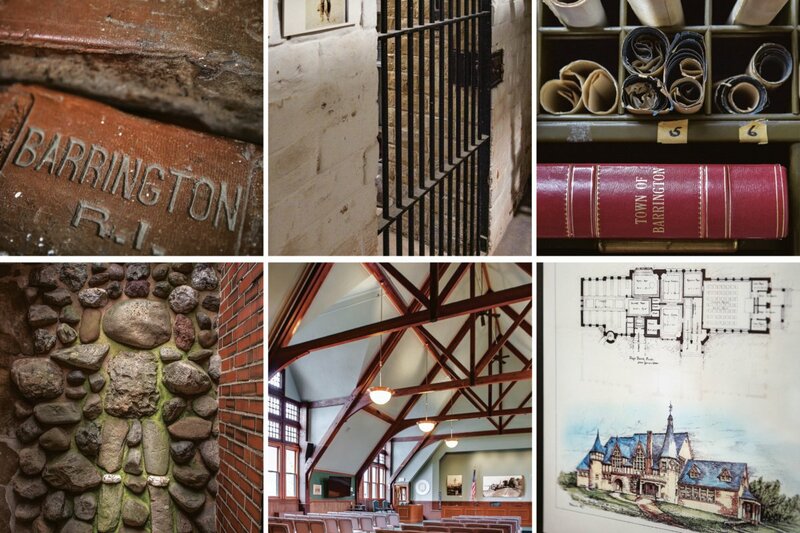 Whether it is the variety of historic photographs of the town of Barrington throughout the council chamber or the land evidence vault stacked with the most beautiful leather-bound books I have ever seen, the space, though transformed many times, has a story to tell. Find a new read at the library and, if time allows, take a good look at the Barrington Town Hall just across the way. Can you find the outline of a person in the stonework near a back exit? The masons were more inventive than you’d think. Even within the smallest details, you may discover a piece of history written (or in this case, bounded) on the walls.